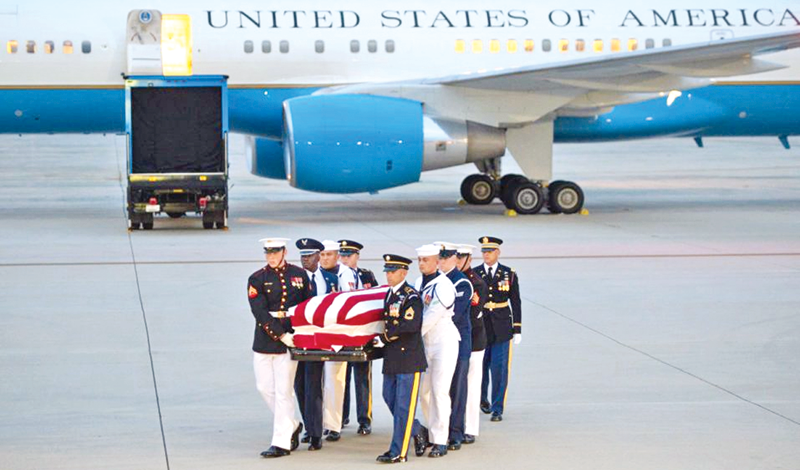 US: Americans yesterday honoured the late national icon John McCain, whose remains were to lay in state in the US Capitol as part of a momentous sendoff for the warrior-turned-politician. Hundreds of members of Congress, including his 99 Senate colleagues, are expected to attend the ceremony, a somber Capitol Rotunda honor that has been accorded to just 30 Americans throughout the nation's history. McCain's final visit to Washington, where he served in Congress for 35 years, will take place over two days. It includes a memorial service Saturday during which former presidents George W. Bush and Barack Obama -- a Republican and Democrat who each ended McCain's White House dreams -- will deliver remarks. On Friday , his coffin will be escorted into the Rotunda and placed on a wooden platform known as a catafalque, first used in 1865 to bear the casket of assassinated president Abraham Lincoln. “John McCain was a giant of our time -- not just for the things he achieved, but for who he was and what he fought for all his life,” House Speaker Paul Ryan said Thursday. McCain “was a patriot and was in service to our country his entire life. We're going to miss him,” tweeted Senator Bob Corker, who like McCain has been an occasional critic of President Donald Trump. The funeral services for McCain, who for months planned his farewell before he died Saturday at age 81 after a yearlong battle with cancer, is seen by many as a thinly veiled rebuke of Trump, whose open disdain for McCain has alarmed many. Vice President Mike Pence will address the gathering instead, joining Defense Secretary Jim Mattis and National Security Advisor John Bolton in representing the administration. McCain's widow Cindy and seven children, along with his 106-year-old mother Roberta McCain, will be present, along with his staff, state governors, diplomats and other dignitaries. McCain's remains were flown by military aircraft to Washington on Thursday from Arizona, which he has represented in Congress since his first election in 1982. Democratic former Vice President Joe Biden delivered a stirring eulogy of his friend at a memorial ceremony in Phoenix, describing Arizona's adopted son as a “brother” and a “giant” whose belief in the soul of America helped give citizens their confidence and optimism. Biden's words appeared at times aimed at striking a stark contrast between his former Senate colleague's integrity and conciliation and the state of political division that has been exacerbated under Trump.